A large, juicy, red berry that is very sweet when ripe and grows on a spreading, stemless plant. Strawberries are eaten raw, used as an ingredient in many salads and desserts, and are also one of the most popular flavorings in candies and other sweet products. Dried strawberries, which make sweet, chewy treats, are also quite common and are often added to snack mixes. Wild Strawberries, which the French consider a delicacy and refer to as "Fraise des Bois" or "strawberry of the woods", are much smaller than the garden variety with much less fruit in each berry. However, the wild variety does provide a significant amount of flavor and are best prepared for food dishes that do not require cooking or any heat prior to serving. When storing fresh strawberries, refrain from washing them until they are being prepared for serving. Keep the berries refrigerated and if possible, place a layer of paper toweling between either layer of berries. When preparing, keep the leaf cap attached as long as possible. 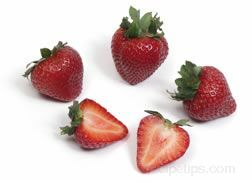 The strawberry can be washed with a light spray of cool water and then allowed to reach room temperature before serving. Leaving the cap attached as long as possible keeps the berry from absorbing too much water, while warming the berry up to room temperature enables to berry to provide the best flavor possible.